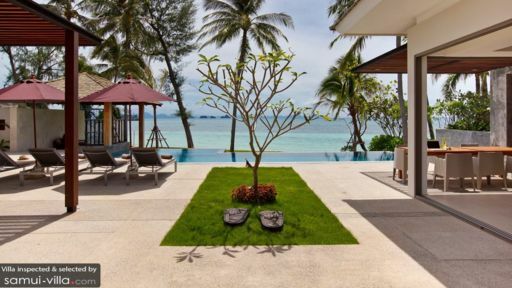 Villa Inasia is a waterfront vacation compound which consists of two residences – the Beachfront residence and the Oceanview residence. The Beachfront residence consists of six pavilions, while the Oceanview residence is a three-storey pavilion – all illustrating contemporary tropical design. Interiors are appointed with carefully chosen furnishings, fixtures and pieces displaying different design accents – weathered and elaborate, as well as brightly finished wood, elegant, as well as in-vogue and lavish. Amenities are deliberately first rate – to assure absolute guest convenience and diversion. 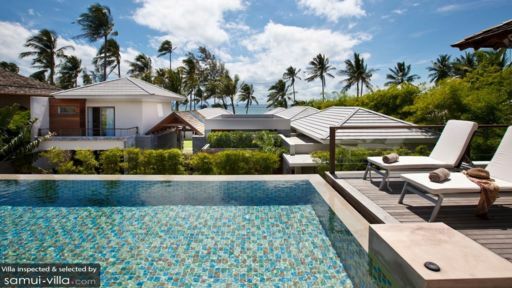 Truly, Villa Inasia extends to you a seaside escape with a quiet, classy appeal. The entire villa has a total of eight air-conditioned bedrooms – four bedrooms in each residence. The master bedroom of the Beachfront residence is in a two-storey, individual pavilion. The three guest rooms are in individual pavilions. The master bedroom of the Oceanview residence is on the third floor. The three guest rooms are all on the ground floor. All bedrooms have dedicated bathrooms. Each residence has a swimming pool – the Beachfront residence pool is at the edge of the property, and the Oceanview residence pool is on its second-floor exterior. Somersault into their beckoning, crystal clear waters for some aimless wading, or for some playful splashing. If you wish to bathe, instead, in the sun, you can stretch out on cushioned, pool beds partially covered by large umbrellas on poolside, wooden decks. But when the temperature rises, withdraw to the shade of the poolside salas and doze off on their soft mattresses and pillows. With an alfresco bar, the swimming area of the Beachfront residence is ideal for cocktail and barbecue pool parties and bonfires especially on chilly evenings. Every residence also has a living area. The Beachfront residence living area is in an individual living pavilion. The Oceanview residence living area is on the second floor of the pavilion. At any of these living areas, you can all converge for moments of family or friendly bonding. There are three dining areas in the entire villa. The Beachfront residence has both indoor and alfresco dining areas also in an individual pavilion. While the Oceanview residence has one dining area also on its second floor. At any of these dining areas, you can all feast on authentic local cuisine – as well as international favorites – concocted by the in-house chef at the fully-equipped, modern kitchen of any residence. On duty to deliver the everyday services of the villa is a helpful, well-trained staff led by a manager supported by mostly housekeepers. Aside from the chef, a babysitter and a spa therapist may be called in upon your request. Their services, however, come with a separate charge. Car rental is available. 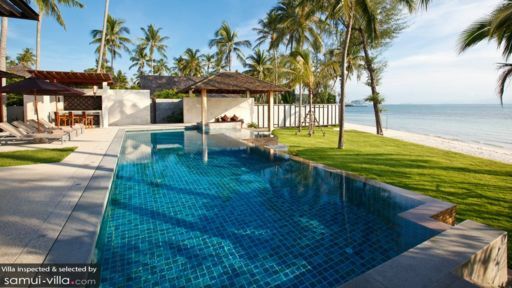 Villa Inasia is located along Lipa Noi Beach. Right in front of the villa, you can already go swimming, snorkeling, or just combing through its fine, white sand shore. In the evenings, you can catch traditional dances and acrobatics being performed in certain parts of the beach. A notable dining spot on the beach is Big John Seafood. We had a wonderful stay. We stayed 11 adults and 5 children for 11 days. When you stay at Inasia you can fully relax. Everything was done for us. Included in the rental is the cooking of the wonderful Thai chef Tom. You have to pay for groceries and a shopping fee, but it is really not expensive. We paid about 550 THB per day per person. The cook suggested what to have for lunch and dinner, we approved, and he went shopping for fresh groceries every day. The staff is there from 6.30 am to 8.30 pm, but most of the time they are invisible. One staff member lives on the grounds in a house in the back. We're a party of 14 and there aren't many options for private villa of this size. Inasia ranked the top on the list and it did live up to its high ranking! Location: It's far from the main tourist area Chaweng, about 45 mins drive. We didn't need to go to town every day so it's not a problem. The villa team helped us book transfer to/fro airport and did the grocery every day at a service charge so we didn't have to worry about it at all. INASIA is a beautiful property, and we had a great stay for a very successful holiday in a place where everything is designed for the well being of guests. Nice beach with nice sunsets, we really also enjoy the food cooked by the Chef Tom. The service is exceptional with a very competent staff and very attentive. We recommend very highly to our friends here in dream.